This year, myeloma patient Alan Wolfson of Lakewood Ranch, Florida, will take an 18-day, 500-mile ride from Virginia Beach, Virginia, to Pittsburgh, Pennsylvania, the destination of his first ride in 2002. He’s leaving May 1 and has already gathered more than $4,000 in pledges for the Myeloma Center. 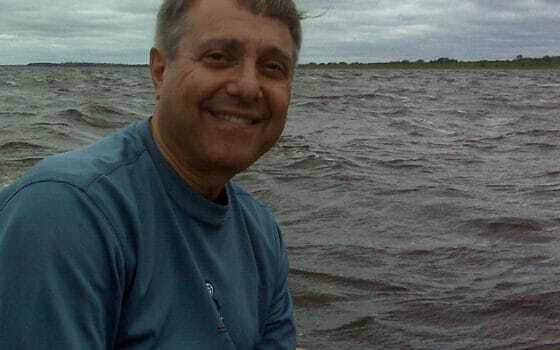 April 1, 2019 | Since 2002, Alan Wolfson of Lakewood Ranch, Florida, has taken an annual bike ride most years along the east coast to raise money for the UAMS Myeloma Center. Averaging about $20,000 in contributions from his friends and supporters for each ride, he’s already pedaled his way to about $210,000 for the center. This year, Wolfson, 69, will take an 18-day, 500-mile ride from Virginia Beach, Virginia, to Pittsburgh, Pennsylvania, the destination of his first ride. He’s leaving May 1 and has already gathered more than $4,000 in pledges for the Myeloma Center. Wolfson, a financial manager with a Florida-based real estate development firm, has MGUS, a precursor to the disease. He was diagnosed in 1998 at 47. While in the first years after his diagnosis, he had numerous visits to the UAMS Myeloma Center and countless tests to closely watch his condition, he has never undergone a day of treatment. He was profoundly affected by his experience. When his local physician called regarding a blood test he wanted Wolfson to have tested further, the husband and father ignored his doctor’s repeated calls. For a year. “He felt I should follow up on it but I was leading such a busy life and was so cocky, I just ignored his calls,” said Wolfson. After a year, he relented and visited an oncologist. The initial oncologist Wolfson saw told him he may have multiple myeloma. When Wolfson arrived for an appointment with Bart Barlogie, M.D., Ph.D., the myeloma program was just being established. The first two years, Wolfson visited the center quarterly for testing, then his visits were decreased to twice a year, then annually. Eventually, he was instructed to visit his local oncologist regularly. “When I was coming every three months, I got to see a lot of the other patients and we began recognizing one another,” Wolfson said. “Visiting with others, I was struck by the manner in which a great majority of them bore their afflictions and that some of the people weren’t coming back. I was affected by the seriousness of this illness and how ordinary people are so brave in the face of it. “I’ve never been that religious but I wondered what can I do to help,” said Wolfson, who donated extra bone marrow to help with research. “One day the idea just came to me that I was going take a bike ride and ask people for money. It was very spontaneous,” said Wolfson, who was then living in Buffalo, New York. That Friday morning, he put his bike on the back of his car and at 4 p.m., called his wife and told her he was going for a bike ride that weekend. “I did no pre-planning and everything I did was wrong,” he recalled, chuckling. “I was on a mountain bike with big tires and I headed in a westerly direction into the wind and as soon as I turned into Pennsylvania, the ride became an uphill one. “It was a very hard ride,” he said of that first 240-mile ride over three days from Buffalo to Pittsburgh. When he returned home, he sent an email to 20 people, told them what he’d done and asked them to make a donation. The first ride raised $9,000 while last year, he raised $22,000. In subsequent years, his rides averaged 257 miles and ranged from three to seven days. Each year, he continued north, traveling eventually to Cochrane, Ontario, and with the help of catching a train, made it as far as the Hudson Bay shore at Moose Factory, Ontario. His rides after moving to Florida have included a trek to Mobile, Alabama, followed by a series of northerly trips. “I figured if I kept riding north, I could continue on to Virginia and eventually make it back to Pittsburgh, where I concluded that first ride,” Wolfson said. That’s his plan for this year. “This ride will be tough. It’ll be through the Shenandoah Valley in Virginia and the Appalachians in West Virginia and Pennsylvania. He plans to ride for 11 days and average about 45 miles a day. The ride will conclude his east coast rides. This year’s fundraising goal is $27,000 and he’s already raised nearly $12,000. Wolfson plans to retire this year but to continue his bike rides. In recent years, he’s also begun donating to the Pines of Sarasota rehabilitation and senior care community specializing in Alzheimer’s and dementia care and Compeer Sarasota, a program that matches volunteer companions with patients diagnosed with mental illness. All totaled, he’s ridden more than 3,000 miles and raised over $231,000 for the three medical facilities he supports. Those wishing to help Alan Wolfson reach, or even surpass, his fundraising goal of $27,000 for this year’s ride may support him, and the UAMS Myeloma Center, by visiting Myeloma Center Giving to make a donation, noting “Al Wolfson Ride” in the gift comments section.